Nation: I regret that I have to remind you that The Colbert Report is no more. I'm still coming to terms with this myself. But after 10 years and over 1400 episodes, Stephen Colbert has a new nightly gig: The Late Show on CBS. The selection of David Letterman's successor was a watershed pop culture moment; these late-night jobs are usually long term, and transitions don't happen often. When Colbert's new post was officially announced, speculation about what a Stephen Colbert Late Show would look like immediately began. The guessing game will be over when the comedian takes over the Ed Sullivan theater for his first episode Tuesday. CBS and Colbert have been keeping some specifics tightly under wraps, but fans should know not to expect a network remake of his Comedy Central series. 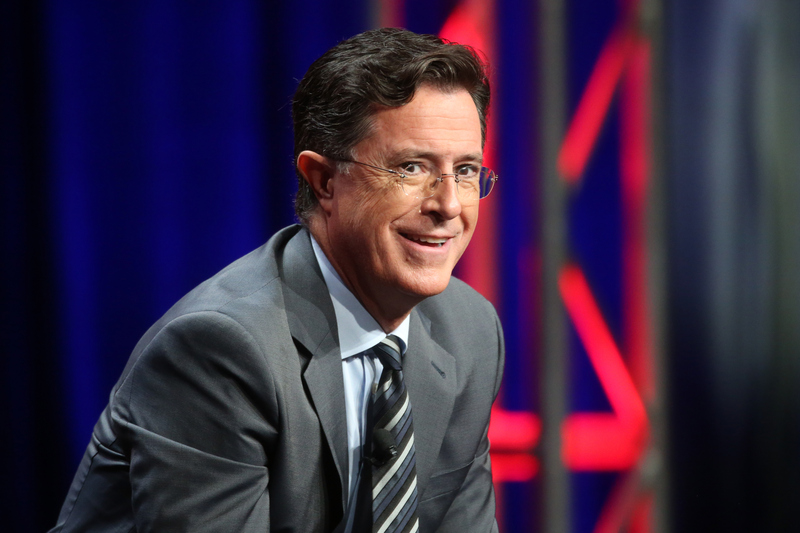 The Late Show and The Colbert Report are different shows in fundamental ways. You can expect, however, that Stephen Colbert will attack this new gig like he did the last. At this year's CBS Television Critics Association presentation, Stephen Colbert told the press (including The New York Times) about his Late Show excitement and the drive he feels as a performer saying, "I want to get in front of the audience and hear the laughter ...The emotion I have right now, it’s not anxiety over doing the show. It’s anxiety of the eagerness to get onstage." 1. Stephen Colbert Will Be Your Host, Not "Stephen Colbert"
While I sort of wish that unsuspecting tourists from all over the world would be exposed to full-on champion of truthiness "Stephen Colbert" when they take their seats for a Late Show taping, that's not what's going to happen. There will be no more "Tip of the Hat/Wag of the Finger," and no more hilariously pompous and one-sided interviews. Colbert's gag ultra-conservative persona won't be making the move to CBS, making the host more of an unknown quantity than his decade in the spotlight would suggest. At the CBS upfronts this spring, the network teased critics with a Late Show promotional video that featured Colbert struggling to locate his own personality. (And showing off his knowledge of the CBS Primetime line-up.) The real test will be whether or not audiences connect with the actual guy as much as they did his character. Colbert has always come off as warm and playful in real life, so that host-to-audience rapport shouldn't be a problem. Last year, jazz musician Jon Batiste and his band Stay Human performed on The Colbert Report as a musical guest. This year, Batiste joins Colbert on stage again, this time as the leader of The Late Show 's house band. The 28-year-old Julliard graduate is also an actor, composer, and proponent of music education. Colbert's dance card isn't entirely full of fellow entertainers. The host has already booked guests like Elon Musk, Bernie Sanders, and United Nations Secretary General Ban Ki-moon, for his first few weeks of shows. However, it's no secret that late-night is prime PR for actors and musicians who are promoting movie premieres and dropping albums. Expect a much higher star quotient than he had over at the Report. The Colbert Report also filmed in New York City, but not in a theater with as much history as the Ed Sullivan. Colbert's new headquarters is just north of Times Square, marked by a sparkling marquee and neighbor to a deli that The Late Show's last host made world-famous. Colbert already got the lay of the land from Letterman, who showed him the secret freight elevator. But, he's also making the studio his own and boldly moving his desk to the opposite side of the stage. USA Today reported that, during rehearsals for The Late Show, Colbert "opened with a seated monologue, graphic screen behind him, and bantered with bandleader Jon Batiste." Colbert told the publication that he's not in the business of torching the standard late-night format. "I don’t see any need to strap dynamite to the wheel and blow it up and reinvent it," he said. A seated monologue sounds much more Comedy Central than network late-night, but the host promises that the topical humor that audiences come to expect at the top of the show will still be there. Rest assured, Stephen Colbert knows comedy and he knows how to host. The Late Show is in capable hands.